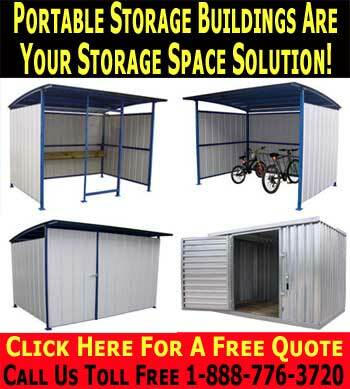 Prefabricated Storage Sheds & Prefab Shelters. One of the most pressing issues for any business is security, and in order to ensure that all of the company assets are properly protected, it is often necessary to add additional storage space outside the main building. Easy Rack offer a number of outdoor storage buildings that can be supplied ready for use, and offer high quality protection for a variety of different purposes. Thanks to many years of experience in providing the largest range of storage and handling solutions available, we understand the needs of a business in terms of storage, and are able to provide the kind of equipment that you need at a price that suits your commercial goals. Our range of storage sheds is versatile, and a simple system allows them to be customized for a wide variety of different purposes. This enables you to get the exact solution that you need so that you can get the additional space that your business demands without having to compromise on the quality of security that you get because you can’t get the kind of building that you really need. A multi purpose construction system means that a variety of different goals can be achieved from a single basic structure and you can simply specify the purpose of your building at the time of ordering, and we will be able to supply the exact building that you need from a number of different options. of 28ga steel on the walls and 18ga steel on the roof. The basic storage shed can be converted for a wide variety of different purposes depending on your needs. By adding a set of doors to one side, it can be a traditional storage shed that offers secure lockable space for containing outdoor equipment, while with the removal of the main wall and inclusion of a rack it makes the perfect bicycle storage shelter. If you have a lot of staff who smoke and want to provide them with a special shelter where they can smoke away from the main building, our storage buildings can be converted for the purpose with the incorporation of a simple bench along one wall. This creates a weatherproof and comfortable location in which staff are protected from the elements, and are also well away from non smoking staff. Whatever the needs of your business, if you require additional storage buildings for any purpose, Easy Rack offer a solution that is reliable, cost effective, and which will prove to be an investment in your business. Thanks to the versatility of the product on offer, you will be able to benefit from getting a high quality product that is ideally suited to almost any role, and which will last for a long time under almost any conditions.